A downswing in poker is bad. Very bad. Soul crunching, teeth grindingly bad. We’ve found ourselves looking at day after day of miserable poker and feeling like we would be better off closing our accounts and doing something else with our time… like complaining about it on Facebook. Okay, kidding. The reality is that every poker player is going to have some bad days. You might fixate a little on all of your losses, but this isn’t something that you want to do forever. When we’re playing a lot of poker and things start going badly, we know that it’s part of the process. But instead of trying to jump out of the anger process/cycle quickly, we give into it for a set amount of time. We log out of our poker account and just let the feelings take over for a little while. It’s often better to get it out of your system than think that you have to walk around carrying it with you from table to table and from game to game. We often dwell on losses more than victories, which is just an odd quirk of being human. Look on the bright side — even though the luck aspect of poker can mess you up, it can also help you move forward. Weak players wouldn’t play poker if it were all about skill. They would have a bad experience every single time. However, the luck aspect of poker is how the weaker players get their “day in the sun” so to speak. They feel renewed by those lucky wins, and so they keep gambling. As you get better, you can take advantage of those players. Hey, that might sound predatory but this is poker — it’s all about becoming the best shark that you can be. You also want to make sure that you’re avoiding getting eaten by other sharks. But you know what? Some days, you’re going to get ate up. And that’s okay. You can log out, take a break, and come back fighting. You might want to think about the other factors that could be affecting your game. For example, you might be playing at a higher level than what you normally commit to. The higher the stakes, the more skilled the players will be. A lot of newcomers think that just because they were doing well at their local card sessions that they can rise to super high levels of poker without breaking a sweat. That’s just not the case at all. You want to always make sure that you’re starting small and working your way up. Analyzing 25,000-50,000 hands before you make a good decision on whether or not you should move up is incredibly important. If you’re overly emotional — stop playing. 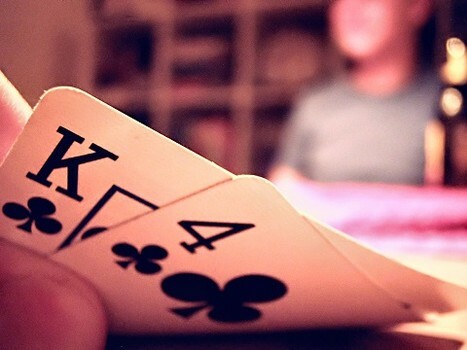 We know that it can be hard to pull away from the table when you feel like the next hand “could be the lucky break”, but the retreat will do more for your game than anything else. When your emotions are running wild, you’re not going to be able to play your best game. If you’re stressed from real life, then taking your stress out on other players or on the cards isn’t going to help you become more profitable. If anything, it’s a surefire way to lose money. Keeping your eye on downswings and handling them with grace is very importantly. You need to get up, look at yourself in the mirror and realize that your best game is yet to come. It doesn’t have to come today, but it will come eventually. For the time being, you’re going to rest and recoup, then get back into the game when you’re ready. Focus on the positive aspects of poker, and you’ll find that the downswings eventually move along in the other direction. Good luck!